Le Cache Model 3800 Wine Cabinet Provincial Cherry (P/N 739). Clean, contemporary design blends equally well with modern, Craftsman, Deco or Asian decors. Hardwood doors and gently arched windows showcase fine wine collections. Sealed seams, premium insulation and tinted double-paned glass provide thermal and UV protection. These options are included in the price of your wine cabinet. NOW EVEN QUIETER! The Model 3800 is designed for passionate wine connoisseurs with sizeable wine collections, with Classic arch windows and storage capacity for 458 bottles. The wine cabinet looks great... It far exceeds our expectations. The unit is better than I thought / hoped it would be. Unlike other storage solutions I thought about buying. this one looks like a real piece of furniture. You will want people to see this! 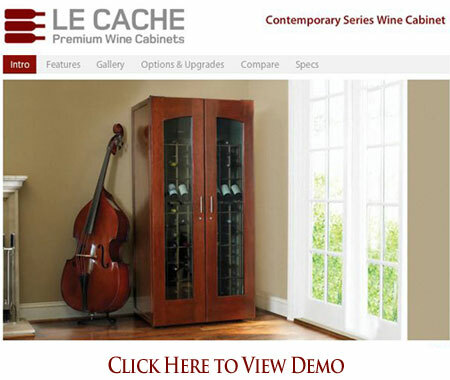 Le Cache wine cabinets immediately impressed all my customers at my steakhouse. The construction of the cabinet, inside and out, exceeded my expectation. It is a finely crafted piece of furniture. Please convey my appreciation to your fine crafts people. They are truly master craftsmen in my book.